Last week, the House Republicans met to consider changes to their Conference’s rules. A number of Members offered amendments, and two passed. One, from Majority Leader Kevin McCarthy of California, permits more than two Congressional Gold Medals to be awarded each year. The other, offered by Representative Tom Cole of Oklahoma, is more consequential for the legislative process. It requires that committee and subcommittee chairmen who seek other offices resign their chairmanships, although they may apply for a waiver from the Steering and Policy Committee. Some speculate that Paul Ryan, the presumptive Chairman of the House Ways and Means Committee, will run for President in 2016, meaning he might have to step aside. 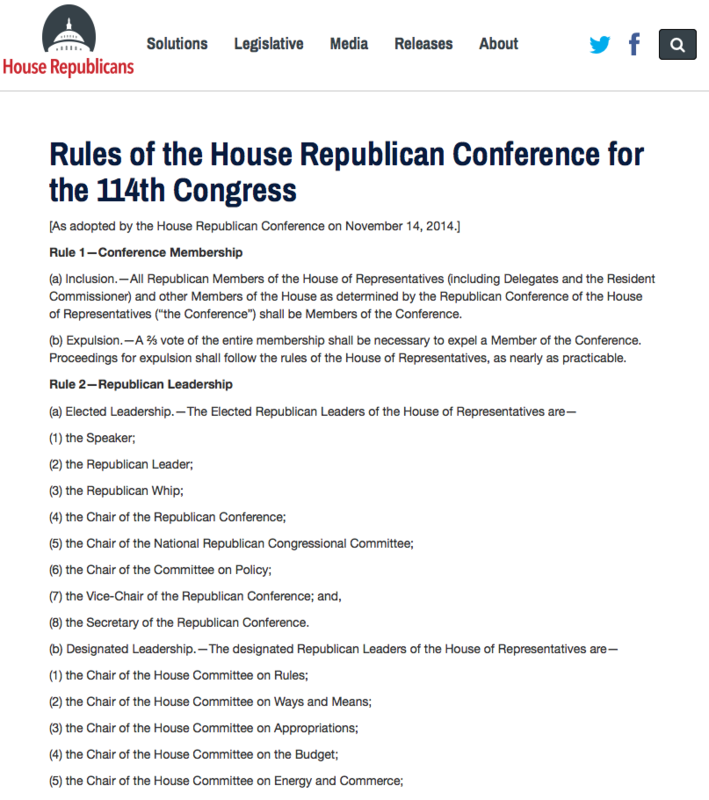 The House Republican Conference publishes its rules online. The 2014 election cycle isn’t even finished yet, so let’s not worry about what Chairman Ryan will do in 2016. Let’s go over something more basic: What are these conference and caucus rules anyways and how do they affect the legislative process? Within each Chamber, the parties have bodies to organize their activities. The Republicans in both Chambers call their organization the Republican Conference and the Democrats in both call theirs the Democratic Caucus. Both sets of caucuses and conferences have rules that govern the parties’ internal affairs. For instance, they specify how leaders are to be elected or chosen and what their powers are. Some offices, like that of the Speaker, are nominated by the party, subject to a vote by the full Congress. Others are elected by the conference or caucus, such as the Majority Leader and Whip. Still other offices, like the House Republican deputy whips, are appointed. They spell out the leaders’ powers and responsibilities beyond those provided for by law or by their Chambers’ rules. They also determine how committee chairs are selected. After a set of elections but before a new Congress convenes, the parties in each Chamber meets to elect new leaders and entertain changes to their rules. 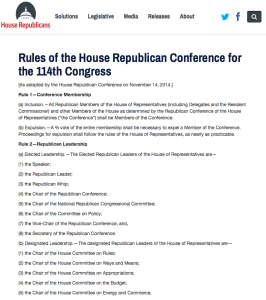 Few people know about these rules, and the House Republican Conference is the only party organizing body in Congress that publishes their rules on their website. They do not have the force of law, nor even of the established rules of their Chamber. They are only binding on party members, but they nonetheless have a major impact on the legislative process. The rules govern many matters, but we’ll discuss only a few, particularly those affecting committee appointments, to illustrate their effects. Knowing how to reform the caucus or conference rules can be one way to shape Congress as a whole. For instance, changes in the House Democratic Caucus’ rules are partly responsible for power dynamics in the Chamber today. From the early 1910s until roughly the 1970s, committee chairmen were the undisputed drivers of the legislative process. They controlled the committee agendas, but unlike today, they were largely independent of their parties, since they were selected according to seniority (i.e., the Member who served on a committee longest became the chairman). As the years went on, a number of conservative Southern Democrats took control of the committees, but systematically blocked legislation the majority of the House Democratic Caucus supported. As the 1960s and 1970s progressed, the liberal wing of the Democratic Caucus pressed for reform of Congress as a whole, but also changes in the Caucus rules. Over the course of a few years, they were in fact able to change the rules to democratize the chairman selection process, culminating in a 1974 reform that required a secret ballot for all chairmanships. For the 94th Congress, the Democrats finally defeated three more senior Members in favor of less experienced chairmen. Today, seniority is still important to the Democrats, but not the sole factor determining who is named the chairman of a committee, meaning there are occasional fights for control. For instance, this year, Representative Anna Eshoo of California unsuccessfully challenged the more senior Representative Frank Pallone of New Jersey to be ranking member of the Energy and Commerce Committee. Aside from reforms in the selection of the committee chairmen, another important Democratic Caucus change that remains critically important is the selection of the members of the Rules Committee. In 1974, the Democrats stripped their Ways and Means Committee members of the power over committee appointments, giving it to the Steering and Policy Committee, with the exception of the Rules Committee. The Speaker of the House was given power over Rules appointments. For many years, the Rules Committee, though controlled by a Democratic chairman, had steadfastly resisted the Democratic majority’s wishes. In the words of Carl Albert, who was Speaker at the time of this reform, the Committee had been “independent and hostile” (237). The reform, adopted a few years later by the Republican Conference, allowed the Speaker to handpick who went on the Rules Committee. It once again became the “Speaker’s Committee”, which allows him almost complete control over the House Floor. Carl Albert, who presided over the House from 1971-1977, considered this change the most important of his speakership. Doubtless he was correct. Today, the Rules Committee determines what bills come to the floor, how long they will be debated, whether or not any amendments will be in order, and if so, what amendments will be allowed, and whether those amendments are subject to the formal Rules of the House. In short, nothing happens on the House floor unless the Speaker wants it to happen – thanks to this change in the caucus rules. The committee appointment reform is only one example of using the conference or caucus rules to shape the legislative agenda. A party can use conference or caucus rules to “persuade” a Member to toe the line. For instance, in 2004, House Minority Leader Nancy Pelosi favored a Caucus rule change that would give the Steering and Policy Committee control over who would be the subcommittee chairmen and ranking members in the Chamber’s most important committees. Previously, the committees themselves made that determination. This change was enacted after some Democrats voted in favor of a Medicare bill that the Democratic Caucus opposed. Earlier this year, we ourselves argued that the House Republican Conference should adopt a rule revoking privileges from those who fail to support the Conference’s nominee for the speakership at the start of each new Congress. Both of these changes strengthen the power of the leadership over the legislative process, a major trend that has shaped Congress over the past few decades. The rules changes discussed above have been fairly significant in their effects on the legislative process. It is hard to predict how far the effects of Representative Cole’s amendment will extend. On the one hand, it is definitely promotes responsible governance. As The Hill quoted Representative Cole, “If you’re running for office the presumption is that you shouldn’t be holding a gavel, because you simply can’t do your job for our conference and run for another well”. It will also allow more junior members to accrue power and influence more quickly, allowing them to leave their mark on legislation and the institution. History is filled with example of people who have “risen to the top” because a position unexpectedly came open earlier in their career—this rule could easily facilitate this phenomenon in the House. This rule does have the potential for long-range effects, but it will be interesting to see how many lawmakers it applies to each year. No House chairman ran for other office for the 2014 elections. Representative Shelley Moore Capito, who will join the Senate next year, is the chairs a Financial Services subcommittee. Representative James Lankford, who will also be a Senator, is a chairman of an Oversight and Government Reform subcommittee. Representative Paul Broun, who put in a failed bid for the Senate, is the Chairman of a subcommittee for the House Science, Space and Technology Committee. Representative Jack Kingston, who also attempted to win the same Senate seat as Representative Broun, is a House Appropriations subcommittee chairman. Presumably, each of these Members would have lost their gavels—will this rule make legislators think twice before trying to move to a different office? It will also be interesting to see how generous the Steering and Policy Committee will be with waivers. Representative Cole told Roll Call that Chairman Ryan is the “perfect example” of one who should receive a waiver. Would the Steering Committee agree? Chairman Ryan is popular and regarded as a serious lawmaker. Would the Steering Committee want to lose this talent at the helm of an important panel? Or are they so committed to the rule that they would be willing to sacrifice his leadership? If Chairman Ryan, who is probably the most well-known legislator in the country, does not qualify for a waiver, who would? Only time will tell the answer to these questions. The point is that, unnoticed and obscure though they are, changes to party rules at the beginning of a new Congress can have profound consequences for the way Congress conducts its business. Albert, Carl. Little Giant: The Life and Times of Speaker Carl Albert. Norman: University of Oklahoma Press, 1990. Remini, Robert. The House: The History of the House of Representatives. New York: Smithsonian Books, 2007.